Here I am now, as usual, to present you events that marked the previous week on our favorite online game. In case you missed some, and/or just love reading my posts. Here we go. On Monday, we got another Fallen Angel collection. The collection is quite typical for this store. Lots of dark colors, with some pink sparkles, red lips (as a pattern), some peplum tops, etc. I gotta say, even the collection looks nice at the first sight, when looking closer, some items seem a bit harder to combine in everyday look. Also, no offense, but look at those prices! You noticed Stardoll gradually increases their prices, I mean, you may notice now, but look back a year or 3 ago. Just saying. First of all, I want to congratulate her for winning. I also want to congratulate everyone that made it into finals. I know it may seem just a silly game, but this accomplishment can really feel nice. Winner has a fairly nice doll. Now I am not really going to go into discussion about fairness of voting, cheating, etc. I want to believe that the winner really deserved it. And honestly, I am glad it is over. MSW14 being over brought another thing that made me really happy. But you will read about it later. This Callie's Picks edition, named True Blue, came out on Wednesday as usual. I really love color blue. It is a color of sea, color of sky, as Callie said. It is calm and relaxing. I think I like those collections centred about one color - we had a red and a black collection as well. This time again, Callie decided to bring back one quite rare and valuable piece of clothing - a beautiful Terry Hearts dress. People were selling it for maximum prices, and even I sold one for 600sd. There is also blue Elle dress, DFV bow, hot buys dress, and some more/less famous items. Fingers crossed for purple collection next time. My highlight of a week was definitely a broadcast price change, back to original to be exact. 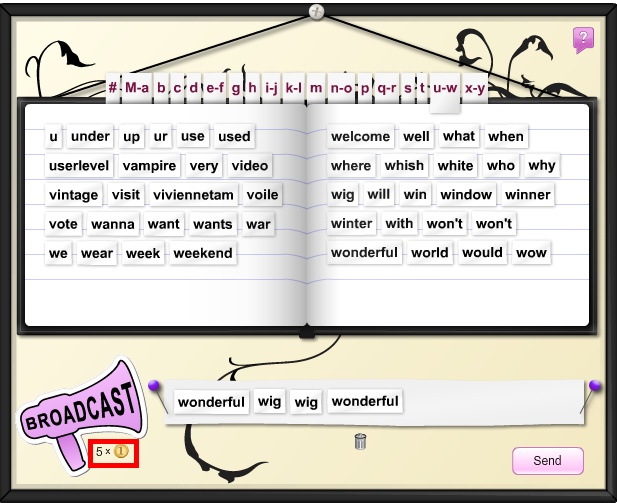 When MSW14 started, Stardoll did that sneaky little things - increased the price of broadcasts from 5 to 8sd. I guess they were expecting people would still broadcasts even with the higher price per message. But few days after MSW ended, they decided to bring broadcasts back to the original price. I guess they noticed people were broadcasting less, spending less money, and this was to encourage them to spend more, and making them think they are saving up. Like me. As MSW14 ended, it is time to say goodbye to MSW inspired store - but it goes with a sale, yay! I already had that gorgeous champagne gown, and was looking forward to buying some more stuff, so it was definitely a nice incentive. But why 30%? We never had 30% sales on Stardoll, had we? I don't mind, any sale is a good sale. Except for the thing that makes you think you are saving up when in fact you are spending more, stuff like that. I don't think I'll buy anything more, but you still have time to decide what to buy, as probably items won't be sellable later. And on Friday, Stardoll released another collection of Fashion Furniture interior store. The collection is inspired by Kirsten Dunst's Soho apartment. 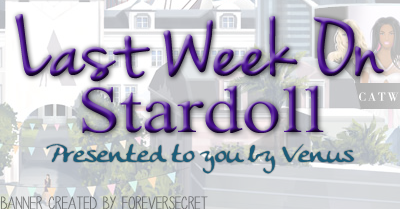 Seems like Stardoll's been using and getting inspired by real life celeb suites/homes/apartments. Which is great, because, now you can not only have clothes worn by celebrities, but also decorate your virtual room like celebs' one. Though, the furniture doesn't seem much special. Chairs, couch, pillow, coffee table - I think we need more 'different' stuff. That concludes my weekly review, recap, whatever you call it. I hope you enjoyed it as I did writing it, vote, comment, and see you next Sunday.